Nothing like another “asymmetric” trade to make the big bucks. Alas, it’s not to be. The final round of the French presidential election is Sunday. The future of the European Union, we’re told, hinges on the outcome. But the outcome, we’re also told, is already known — the pro-EU candidate, Emmanuel Macron, will easily top the anti-EU and anti-immigration Marine Le Pen. On the surface, it sounds like an opportunity for another asymmetric trade — the kind Jim Rickards likes so much. If the unexpected outcome occurs, you win big. But if the expected outcome occurs, you don’t lose much. Jim recommended an ideal asymmetric trade on the “Brexit” vote in Great Britain last summer. Some of his readers generated a 129% gain in only three days. He tried again with the U.S. presidential election. On that one he got the call right, but not the timing of the market’s reaction. Gotta get both right if you want to win big. Say this much: The parallels to the final weeks of the U.S. campaign last fall are spooky. We alluded to that phenomenon after the first round of the election two weeks ago. We watched an election-night panel discussion on France 24, the state-run English language news channel. The panel was lopsidedly pro-EU. The consensus was suffocatingly predictable: Macron is more sensible, more qualified. Establishment factions that lost in the first round will rally behind Macron to stop Le Pen. How could it be otherwise? As Jim Rickards explained to us, Le Pen speaks for the disenfranchised Trumpians of France. Macron, on the other hand, is best compared not with Hillary Clinton but with Barack Obama — a cosmopolitan creature of the establishment who nonetheless has many people convinced he offers hope and change. On Wednesday, Macron and Le Pen squared off in a debate. It was two hours and 40 minutes of nearly nonstop personal insults. Afterward, the establishment consensus — surprise, surprise — was that Macron won. “French pundits, newspapers and a highly regarded viewers’ poll all declared the centrist candidate the most convincing,” reports the BBC. Hmmm… The asymmetric-trade possibilities look more and more attractive, no? With French polls opening around the same time young Americans stumble home from Saturday-night partying, opinion surveys give Macron a runaway lead — 62% to 38% for Le Pen. Jim Rickards told us a week and a half ago that Macron was set to win. Jim’s even more convinced now. It would take a genuine black swan event — a terrorist attack, or something scandalous revealed about Macron — to turn this one around. “But those are wild cards, not fundamental analysis,” Jim tells us. There will be no asymmetric trade this time. We share these musings today as a sort of behind-the-scenes glimpse at the thought and analysis that goes into our editors’ picks. For every recommendation they issue their readers, there are two or three or even a dozen that don’t make the cut. “I agree with Jim,” says Jim’s senior analyst Dan Amoss. “There’s a vanishingly low probability of a Le Pen win. Aw c’mon, Dan, don’t string us along here! Over email with a handful of us, he offered up a suggested trade. We’re debating among ourselves whether to share it with you — even with the proviso that unlike with our subscription services, this is a free e-letter and you get what you pay for. While we chew on which direction to take, we turn our eyes to today’s market action — such as it is. Yet again, the major U.S. stock indexes are going nowhere. The biggest movement is in the S&P 500, up all of 0.12%. Gold is holding its own after getting battered all week, the bid now $1,228. Overnight, West Texas Intermediate crude sank below $45 a barrel for the first time in five months, and Brent crude — the international benchmark — sank below $50. But both are staging a modest recovery as the week winds down. It looks as if the lousy job number from March was a one-off. It being the first Friday of the month, the Bureau of Labor Statistics is regaling us with its monthly unemployment numbers. The wonks conjured 211,000 new jobs for April — more than expected. The unemployment rate fell to 4.4% — the lowest since May 2001. The most noteworthy job number isn’t in any official report, but rather the data from Shadow Government Statistics. As you might now, “ShadowStats” calculates the unemployment rate using the same methodology the feds used 40 years ago — before the feds started fudging the numbers to make them look better. If you take all the people in the official unemployment number… and add all the part-timers who want to work full time… and add all the people who’ve given up looking for work, no matter how long ago… you get a real-world unemployment rate of 22.1%. That sounds horrible, yes — but it’s a sharp drop from 22.5% the month before. And it’s the lowest reading since October 2010. “This one has to go down as the dumbest quote of the week,” says a note from our income maven Zach Scheidt. Tesla, the maker of costly virtue-signaling electric-powered cars, turned in a lousy earnings report this week. Indeed, TSLA posted its biggest-ever quarterly loss. As a reminder of what happened next, the Nasdaq collapsed nearly 80%. In addition to the record loss, TSLA “has a record $7.1 billion in long-term debt,” Zach goes on. “And yet the stock remains one of the most popular investments for both professional and amateur investors and is up about 45% year to date. “At some point, investors will wake up and realize that Tesla’s $48 billion market cap is built on nothing but speculation,” Zach warns. “And when that happens, look out below! The ‘true believer’ investors will be left with major losses, despite the fact that Tesla makes a great car that is insanely popular. “Don’t let this scenario happen to you. For some of Zach’s favorite names that exceed his standards — and that pay a respectable level of income, of course — look here. While earnings absolutely do matter, they matter in a special way for early-stage biotech names. “What these companies report can set the stage for us to enter profitable future trades,” explains Ray Blanco of our science-and-wealth team. We’re talking about companies that aren’t turning a profit yet — companies you buy on the promise of bringing a blockbuster drug or device to market. If they don’t manage their cash wisely, they have to issue more shares — diluting the value of the shares you already own. “Development-stage biotechs trade on the potential of their science,” Ray goes on. How big a gain we could realize depends on the market cap of a biotech coupled with a therapy’s market size and the perceived risk of whether or not it can make it through clinical trials and regulatory approval unscathed. Yes, Ray has a favorite right now. You can learn about it at this link. in people’s pockets,’ which in turn will (hopefully) be spent out in the fruited plain of the US of A. And then more spending brings more tax revenue to the government (which isn’t very frugal with tax dollars). “Didn’t Presidents Kennedy and Reagan preside over cuts that helped with growth? But then didn’t David Stockman refute supply-side economics when he was in D.C.? The 5: Wait, wait, where’s the “but ”? Government can fund its priorities only three ways — taxing, borrowing or printing money. If tax cuts aren’t accompanied by spending cuts, that means Uncle Sam has to either borrow or print money. If the government borrows, that means there’s less money available for the private sector to borrow so it can expand operations, hire people and so on. (That’s the so-called “crowding out” effect.) If the government prints money… well, that’s how the dollar of 1913 has lost 96% of its purchasing power. “How and when is gold going to turn around for good?” writes an understandably frustrated reader. “Any prediction on the future ahead for gold? You can also include silver in your best-guess answer. The 5: We hate to fall back on the old line “Events that are inevitable aren’t necessarily imminent,” but it never hurts to keep that in mind when contemplating something like Jim Rickards’ $10,000 gold forecast. The short story is that both metals are at an important juncture — even though both remain above their lows late last year. Gold is at risk of breaking its chart pattern of “higher highs and higher lows” dating back to that late-December low. Silver has already done so. It’s not the end of a precious metals bull by any stretch… but it will make the climb back a longer and more laborious process. 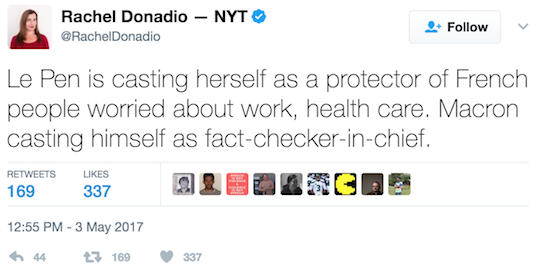 Big claims require big proof, of course. Here’s where to get it. If you want take a flyer on the French election, as we discussed above, here’s the trade Dan Amoss says you can lay down. Just remember our long-standing policy: Our analysis comes free. Our specific advice and recommendations require a paid subscription. Here’s a free trade that we won’t call a recommendation or even a suggestion. It’s, as we just said, a flyer. 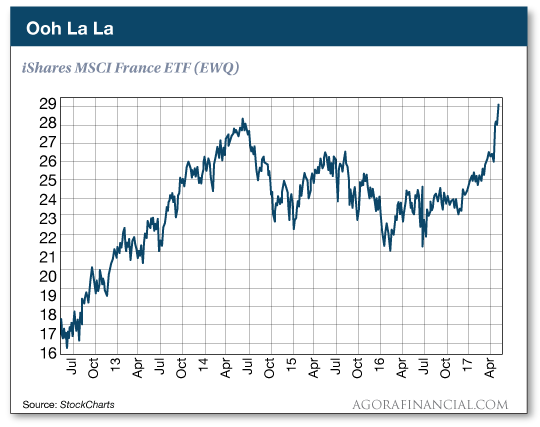 We’re talking about put options on the iShares MSCI France ETF (EWQ). Buy the EWQ May $28 puts. Put in a limit order for 25 cents on these put options and you’ll likely get filled. “The neat thing,” says Dan, “is that even if Macron wins, the odds are good that we’ll see a ‘buy the rumor/sell the news’ type of decline in EWQ next week. “If Macron wins, there might still be a chance to break even or sell a little above 25 cents. Two important caveats, says Dan: First… If you do this, sell by May 12 — next Friday. That’s win, lose or break even. The puts expire on May 19. Second… Don’t put any money at risk that you’re not willing to lose. Be ready for this trade to end up with a 100% loss.